IN MEMORY OF DAVID H. HANSEN. The fibers of plants have been exploited by man for the production of tools and conveniences for untold thousands of years. Examples of such plant-fiber artifacts as cordage, basketry, brushes, etc., have been discovered well-preserved in arid environments in Egypt and can be found in museum collections throughout the world. Despite their importance in the daily lives of the ancient Egyptians, relatively little attention has been paid to their study. The functional capabilities of plant-fiber artifacts are primarily based upon the variables of size, structure, and the various properties of the materials of manufacture. This latter crucial variable serves as the focus of this article. The materials which comprise plant-fiber artifacts in their many forms have been identified and reported in numerous Egyptological publications (Lucas and Harris 1962 pp.128-137). It is, however, unfortunate that a likelihood exists that a great many of these materials were identified with less than exacting methods and the identifications may very well be erroneous. It is exceedingly difficult to ascertain the identification of ancient fibers by visual inspection alone; the assumed common method of many scholars of the previous century and since. Indeed, manufacturing processes, age, and desiccation tend to distort the external morphological distinctions which are not always readily apparent even in fresh specimens. The only reliable means of identifying artifactual fibers is by examining the fibers' micro-anatomical structure. This examination can often lead to an identification of the material to the species level. Micro-anatomical techniques are common botanical procedures (Johansen 1940) which typically involve embedding a small sample of a given fiber after which it is thin-sectioned, mounted on a slide, and stained. The fiber is identified by comparing its microscopic structure to that of reference slides of verified materials. With cordage, for example, species-specific identifications can be made which are superior to mere categorical guesses, e.g., Phoenix dactilifera or Hyphaene thebaica instead of "palm". The vagueness of categorical identifications results in the loss of valuable data concerning such topics as ancient plant distribution patterns and perhaps most importantly, species-specific cultural utilization of plant fibers for various functions. Categorical naming also tends to mask the distinction between plants through colloquial terminology. For example, though the modern fellahin of Egypt use the same name, "halfa", to describe two similar-appearing grasses, two distinct genera are represented: Desmostachya and Imperata. A recent sample of ancient Egyptian cordage housed in the British Museum (Ryan and Hansen, 1987) has revealed some surprising if not disturbing data regarding the quality of plant-fiber identification in Egyptian artifacts. The sample was considered random and typical; the problematic conclusions are believed to be widespread in many collections. Sixteen specimens were microscopically examined for which material identification was also sought from artifact labels, register data, and other sources (Table 1). Twelve specimens possessed previous material identification, while four offered none (No.s 2,4,5,14). Of the twelve, only two (No.s 15 and 16) indicated correct material identifications based on modern micro-anatomical methods. The other ten were identified presumably by external visual appearance in the field or later. All ten of these specimens were misidentified. The implications of this problem are great; many of the earlier materials identifications of objects in collections and publications may be suspect. Though cordage has been utilized in the example above, misidentifications are likely spread throughout the realm of ancient fiber products. Several sources exist which potentially influenced or continue to influence both earlier archaeologists and those of today in their attempts to identify ancient fiber materials. Again, cordage will serve as the case example. Ethnological observation: The predominant material utilized in recent times in the manufacture of cordage by the fellahin has been fibers derived from the date palm, Phoenix dactilifera. Ropes of this material can be seen functioning in numerous capacities throughout Egypt today as noted by such ethnographers as Blackman (1927 p.16) and Lane (1978 p.311). Though date palm fibers were indeed utilized for cordage in ancient Egypt, some modern botanical studies (Greiss 1949, 1957, Ryan and Hansen, 1987) seem to indicate a much higher ancient reliance upon a halfa grass (Desmostachya bipinnata) and papyrus (Cyperus papyrus), a plant which no longer grows naturally in Egypt. Classical sources: Herodotus (History VII:36), Pliny (Natural History XIII:22) and Theophrastus (Enquiry into Plants IV:8:3) all commented upon Egyptian cordage, yet mentioned only papyrus. It is interesting, especially given the role the likes of Herodotus have received in the shaping of early Egyptological thought and literature, that none of the misidentifications listed in Table 1 cited papyrus. Ethnocentric bias: Ethnocentric bias is a powerful perception-altering influence which is often wanting in its ability to accurately assess reality. Example No. 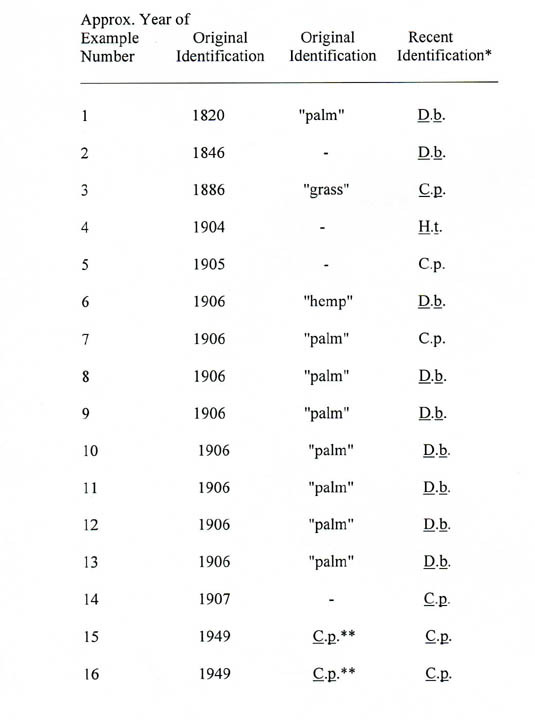 6, Table 1, may indicate an identification based upon a Western perception of cordage, much of which has been produced from materials imported from Southeast Asia such as hemp (Cannabis sativa). Perhaps the mere identification of the artifact as a fibrous rope was sufficient to produce an ethnocentrically-based misidentification of material. Perpetuation: Once a misidentification becomes established through publication or some other data-sharing mechanism, it is well on its way to becoming a "fact" firmly entrenched in the Egyptological literature. Example No. 1, Table 1, which is a rope discovered by Belzoni in the tomb of Sethos I, serves as an illustration. The discovery of the rope was originally reported in Belzoni's Narratives (1820 pp.232-233) and was thereafter misidentified in various editions of an exhibition booklet (Anonymous 1821 pp.9,15), an auction catalog (Anonymous 1822 p.8), museum labels and registers, and has been perpetuated in a definitive biography of Belzoni (Mayes 1957 p.262). In conclusion, it is hoped that a case has been made for the critical review of plant-fiber identifications and a questioning of methodologies. Ancient Egyptian plant-fiber industries are beginning to receive increasing attention (e.g., Gourley 1981, Ryan and Hansen, 1987) and future studies should benefit enormously through the adoption of rigorous methodology such as micro-anatomical technique. Such techniques can often be time-consuming and laborious, but the necessity for accurate identifications for a rigorous treatment of artifacts precludes the use of less exacting methods. * Complete data for all specimens can be found in Ryan and Hansen (1987). Appreciation and thanks are extended to David H. Hansen and the Department of Biology, Pacific Lutheran University; T.G.H. James and his staff at the Department of Egyptian Antiquities, The British Museum; the Division of Humanities, Pacific Lutheran University; Sherry L. Ryan; and Mr. and Mrs. M.D. Schwartz. Anonymous, 1821, Description of the Egyptian tomb discovered by G. Belzoni. London: John Murray. Anonymous, 1822, Catalogue of the various articles of antiquity, to be disposed of, at the Egyptian Tomb, by auction or by private contract. London: William Clowes. Belzoni, Giovanni Battista, 1820, Narrative of the operations and recent discoveries within the pyramids, temples, tombs, and excavations, in Egypt and Nubia. London: John Murray. Blackman, Winifred, 1927, The Fellahin of Upper Egypt. London: Narrap. Davies, Norman de Garis, 1900, The mastaba of Ptahhetep and Akhethetep, Part 1. London: Egypt Exploration Society. Davies, Norman de Garis, 1947, The tomb of Rekhmire at Thebes. New York: The Metropolitan Museum of Art. Gourlay, Yvon, 1981, "Les sparteries de Deir el-Medineh." L'Institut français d'archaeologie orientale, Documents de fouilles, XVII. Paris. Greiss, E.A.M., 1949, "Anatomical identification of plant material from ancient Egypt." Bulletin de l'Institut d'Égypte 31:249-283. Greiss, E.A.M., 1957, "Anatomical identification of some ancient Egyptian plant materials." Memoires de l'Institut d'Égypte 55. Johansen, Donald A., 1940, Plant microtechnique. New York: McGraw Hill. Lane, Edward W., 1978, An account of the manners and customs of the modern Egyptians. London: East-West Publications. Mayes, Stanley, 1959, The Great Belzoni. London: Putnam. MacKay, Ernest, 1916, "Note on a new tomb (No. 260) at Thebes." Journal of Egyptian Archaeology 3:125-126. Ryan, Donald P. and David H. Hansen, 1987, "A study of ancient Egyptian cordage from the British Museum." British Museum Occasional Papers 62.